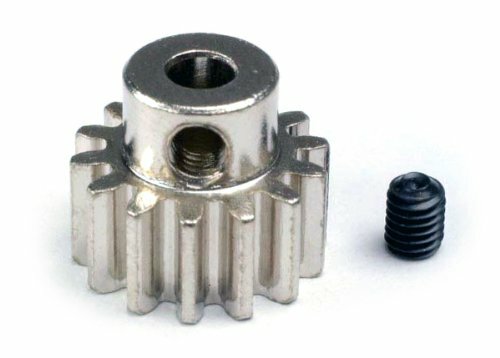 Gear, 19-T pinion (48-pitch) / set screw. 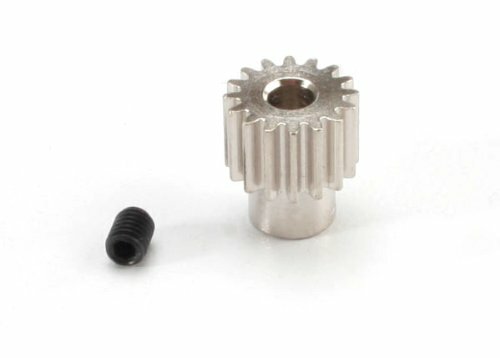 Optional Traxxas pinion gears allow you to increase or decrease the final drive ratio and tune for different applications. Larger gears will result in higher speeds while smaller gears provide more torque. 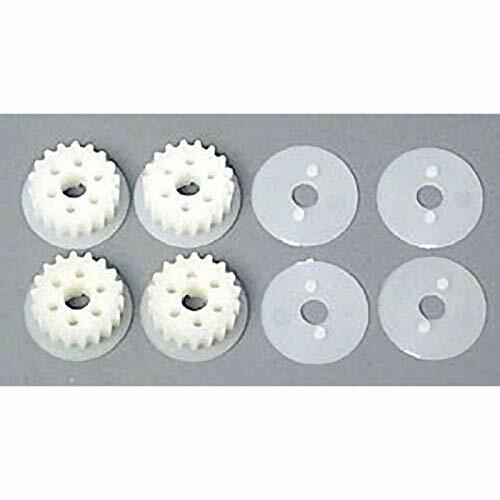 These are designed for use with 48-pitch spur gears and 3mm motor shafts. Use Traxxas stock and hop-up replacement parts to get the most out of your Traxxas RTR vehicles. This product is made from high quality materials and designed for long-lasting performance. This is replacement hardware for use on Traxxas vehicles; consult your user's manual for exact parts listings. Use Traxxas stock and hop-up replacement parts to get the most out of you Traxxas RTR vehicles! This product is made from high quality materials, and designed for lasting performance. This is replacement hardware for use on Traxxas vehicles, consult your user's manual for exact parts listings. 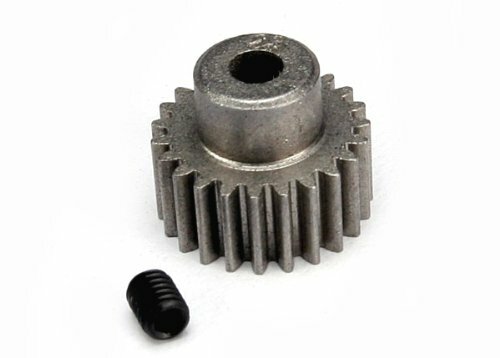 This is the 2416 Pinion Gear 48P 16T with Set Screw from Traxxas. Traxxas has grown to become the number-1 selling name in RTR nitro and electric models for the last 4 years running. No one has done more than Traxxas to advance the RTR category with innovative thinking and fun designs that make it easy for anyone to get started in the great R/C hobby. Traxxas, truly the fastest name in Radio Control. 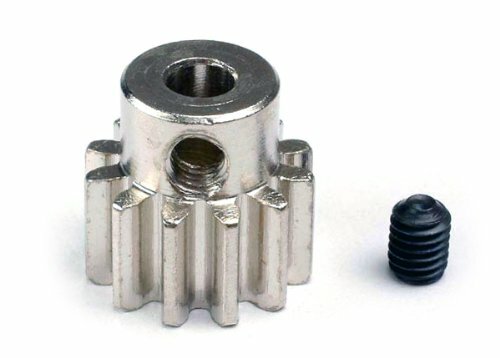 Gear, 28-T pinion (48-pitch) / set screw. Optional Traxxas pinion gears allow you to increase or decrease the final drive ratio and tune for different applications. Larger gears will result in higher speeds while smaller gears provide more torque. 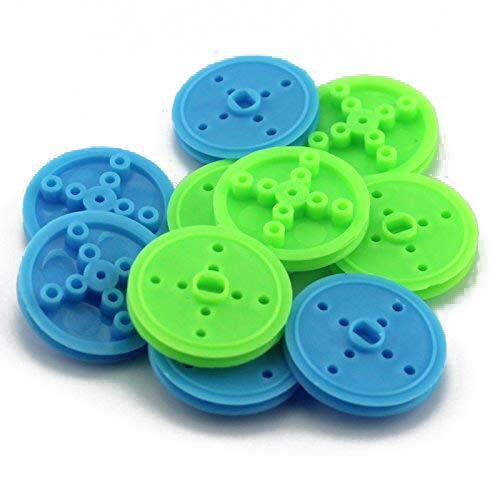 These are designed for use with 48-pitch spur gears and 3mm motor shafts. Use Traxxas stock and hop-up replacement parts to get the most out of your Traxxas RTR vehicles. This product is made from high quality materials and designed for long-lasting performance. This is replacement hardware for use on Traxxas vehicles; consult your user's manual for exact parts listings. Gear, 23-T pinion (48-pitch) / set screw. 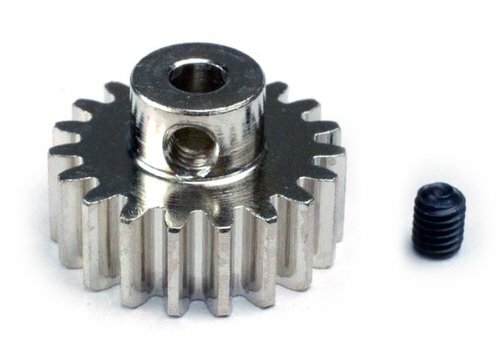 Optional Traxxas pinion gears allow you to increase or decrease the final drive ratio and tune for different applications. Larger gears will result in higher speeds while smaller gears provide more torque. 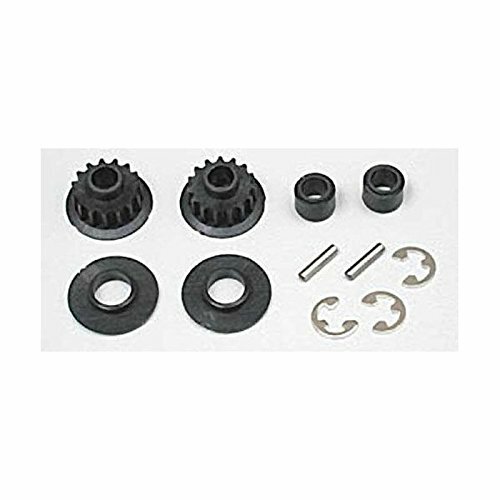 These are designed for use with 48-pitch spur gears and 3mm motor shafts. Use Traxxas stock and hop-up replacement parts to get the most out of your Traxxas RTR vehicles. This product is made from high quality materials and designed for long-lasting performance. This is replacement hardware for use on Traxxas vehicles; consult your user's manual for exact parts listings. This is the 3949 Pinion Gear 32P 19T E-Maxx from Traxxas. Traxxas has grown to become the number-1 selling name in RTR nitro and electric models for the last 4 years running. No one has done more than Traxxas to advance the RTR category with innovative thinking and fun designs that make it easy for anyone to get started in the great R/C hobby. Traxxas, truly the fastest name in Radio Control. 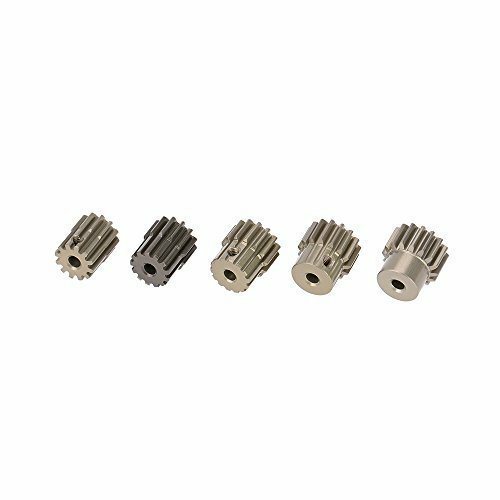 Gear, 14-T pinion (32-p) (machined steel)/ set screw. 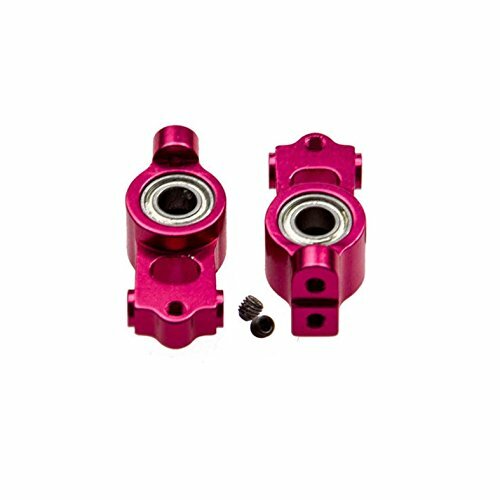 Traxxas offers these precision machined 32-pitch gears to allow a variety of gearing options. Larger gears will increase the speed of the vehicle, while smaller gears will increase the torque. The machined-steel pinions include set screws and the larger gears are machined to remove unnecessary weight. Use Traxxas stock and hop-up replacement parts to get the most out of your Traxxas RTR vehicles. This product is made from high quality materials and designed for long-lasting performance. This is replacement hardware for use on Traxxas vehicles; consult your user's manual for exact parts listings. This aluminum rear hub carrier used for 3Racing Sakura D4 sport car. 30mm diameter pulley, aperture 1.9mm with 2mm shaft. Transmission structure can be made, but also can be used as a small wheel. 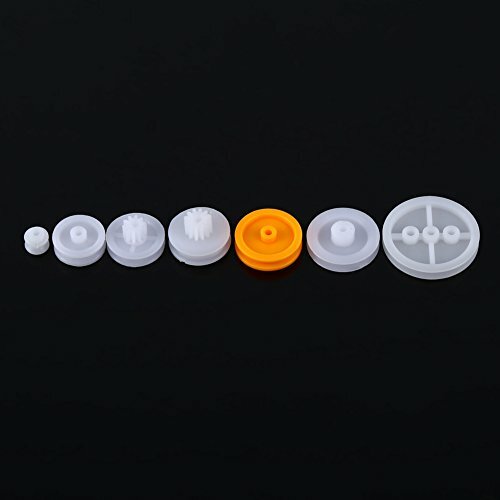 102B: 12mm pulley+102B gears, inner bore 2.05mm, loose-fitting(large wheel OD 14.6mm, small wheel OD 5.75mm) 122B: Diameter 16mm, gear of 12 teeth, modulus 0.5, inner bore 2.05mm, loose-fitting. 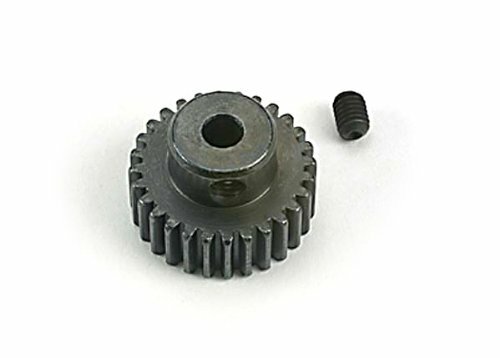 This is the 3942 Pinion Gear 32P 12T E-Maxx from Traxxas. Traxxas has grown to become the number-1 selling name in RTR nitro and electric models for the last 4 years running. No one has done more than Traxxas to advance the RTR category with innovative thinking and fun designs that make it easy for anyone to get started in the great R/C hobby. Traxxas, truly the fastest name in Radio Control. 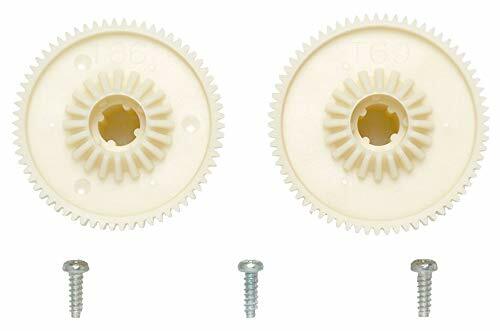 This 32DP 5mm 13T 14T 15T 16T 17T motor pinion gear is meshed perfectly to drive motor, It provides great wheel speed and plenty of torque. 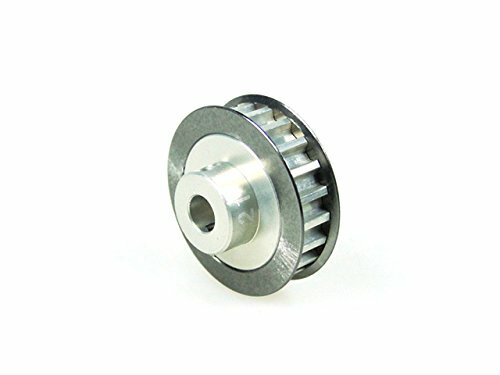 This aluminum Center Pulley Gear T16 use for 3Racing Sakura D3 / D4 sport car. 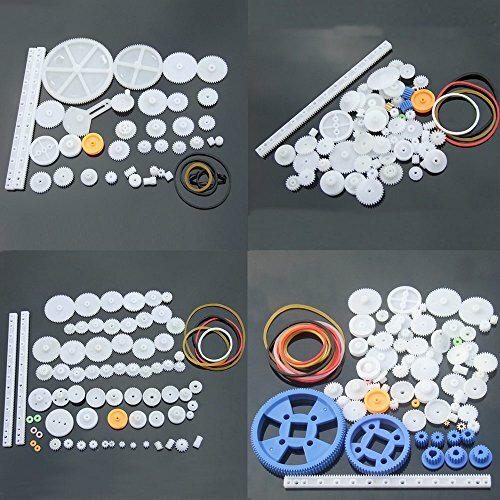 Timing pulley 18T street Force GP (4), tough plastic construction white in color. Four white 18T timing pulleys four side caps comments: these are held on the shaft by a 2x10mm pin (Dtxc8310). Jim 6/14/00 ir/jl. This product is manufactured in Taiwan. Give your All a bit more power, agility and better handling! It takes 5 to 10 business days to arrive by standard airmail shipping. Most packages are packed and shiped within 12 hours. Expediated shipping is shipped by DHL or EMS. Packages will arrive in about 2-4 days. Warranty: Please refer to manufactuer warranty. If there are manufacture defects or any quality issues upon receiving your products, please contact us immediately. To return items, please keep the item condition new.